Kevin Stone is a senior fabricator who began applying his welding and drawing skills to the creation of massive stainless steel sculptures back in 2005. Since then, he has used the Gas Tungsten Arc Welding (GTAW/AKA TIG) process to produce an impressive collection of eagles, dragons, dinosaurs, and more. 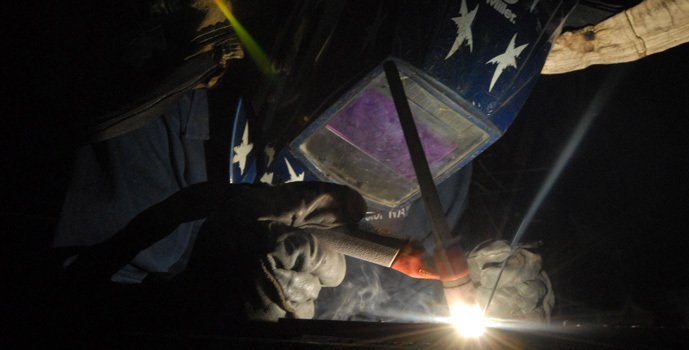 Welding stainless steel can be tricky because it is very good at retaining heat, and this can lead to problems such as warping, embrittlement, and rust. In fact, as little as five amps can make the difference between the perfect weld and a blued or burnt-through part. 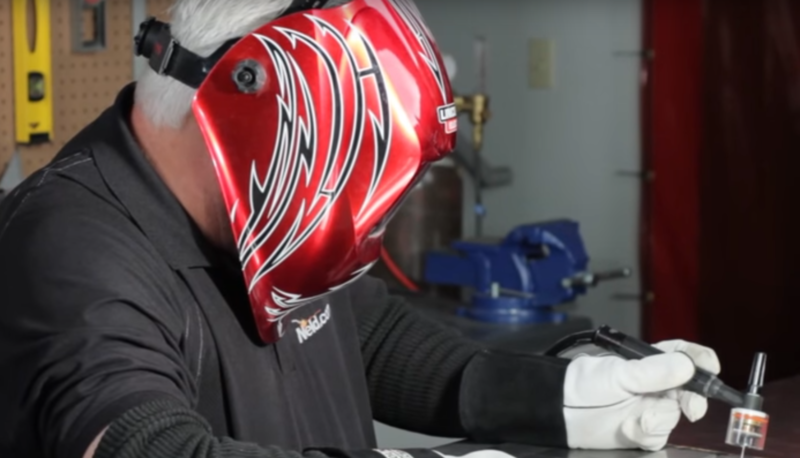 Fortunately for us, there are a series of tried and true tips that all of us can use to control heat input and master the art of TIG welding on stainless steel. Proper fit up – Proper fit up ensures that only the required amount of filler metal is used. You can’t add filler metal without adding heat, so you don’t want to find yourself filling gaps. Filler metal – The thicker the rod or wire the more heat is required to melt it. Therefore, the diameter of the filler metal should be thinner than the base metal. To ensure the integrity of the weld, the filler metal and base material should be chemically compatible and possess similar mechanical properties. Electrode size – Common tungsten electrode sizes range from 3/32 to 1-1/4 of an inch. Selecting the right size depends on variables such as polarity, amperage, joint size, and base metal thickness. Make sure you check the manufacturer’s recommendations for the proper size. Electrode geometry – A taper of no more than 2.5 times the electrode diameter creates a focused arc capable of producing deep, thin beads, and a narrow heat-affected zone. If the electrode has a taper of more than 2.5 times its diameter, the arc may fan out. This results in less penetration and a wider heat-affected zone. Fingertip and foot control – A foot control allows for a more precise control of amperage and doesn’t interfere with your torch hand. However, when welding on ladders or awkward positions, a fingertip control may be the only way to go. There are different designs, so make sure you select the one that works best for you. If your welder is relatively accurate you’ll only need to adjust the fingertip or foot control a little bit to manage heat input. Begin with low amperage and let the puddle to form. Then, pull back two or three amps and add filler. Puddle size – The weld puddle should be the thickness of the base metal. If the puddle grows too large, use your fingertip or foot pedal control to reduce heat input. You can eliminate craters by easing down the current at the end of the weld and adding a filler metal until the puddle solidifies. Gas flow and travel speed – Keep the gas flowing and directed at the puddle until the orange color fades. The post-flow also cools the puddle and the electrode. Don’t move the torch too fast. This can blow gas away from the electrode, turn it black, and make it more difficult to start next time. Polarity and pulsing – Use pulsed gas tungsten arc welding (GTAW-P) with a direct current electrode negative current. In pulsing, the current alternates between a high peak amperage and a low background amperage. The peak current provides good fusion and penetration, while the background current maintains the arc and allows the weld area to cool, preventing warping, embrittlement, and carbide precipitation. The higher the frequency of pulses (measured in pulses per second or PPS) the more narrow and concentrated the arc cone. This in turn, increases penetration and narrows bead width. Moreover, the rapidity of the pulses limits heat input. High-speed pulsing (generally above 100 PPS) helps agitate the puddle and release any porosity or gas trapped in the weld. Conventional TIG welders are limited to about 10 PPS. To improve their proficiency, inexperienced welders can count the pulses (from .5 to 2 PPS) to time the movement of the torch and the cold wire. However, more experienced welders will want to use a TIG inverter capable of producing hundreds or thousands of pulses per second. For welding carbon or stainless steel start at 100 PPS and work your way up to about 500 PPS. Remember to breathe normally. “Many people tend to hold their breath, but this can have the opposite effect,” says Stone. “Also, a gentle grip makes for a steadier hand. Hold the torch firmly but not too tightly or fatigue will set in and lead to shaking.” Always check your settings and technique on a test piece beforehand, and of course, PRACTICE, PRACTICE, PRACTICE! TIG welding stainless steel can be challenging but the results are well worth the effort. Stainless responds very well to proper technique and that includes gas lenses, gas trailers, torch angle and I’m very pleased that you addressed electrode grind geometry! Many welders don’t pay enough attention to this critical parameter and some even mistakenly grind to a taper exceeding 3x the electrode diameter! Correct tungsten diameter for amperage range should also be adhered to. Pulsing, especially on advanced inverter machines, really helps in using less total heat energy per length of weld and creating a high quality weld while stiffening the arc to focus fusion in the weld area while minimizing the HAZ. Many factors figure into the quality of the weld being produced regardless of the metal to be welded. Condition of equipment, visual acuity, torch angle, arc length, electrode stick out, cup size and welder skill and experience to name a few. The best way to perfect technique is through practice, observation of others and to listen to other welders, especially if they demonstrate the skills you wish to achieve. Is 1 1/4″ diameter tungsten a typo? I’ve never seen tungsten that large used for GTAW. Thanks! Typically tungsten diameters would be 0.010 to 1/4 inch. Each tungsten diameter has a current/ampere carrying capacity. Match the ampere requirements to the tungsten diameter. A good starting point would be 1 ampere for 0.001 thickness. Tungsten sales brochures like from Weldcraft, Conley Kleppin/CK or Diamond Ground have recommendations for a tungsten type and diameter. I would like to thank you for the efforts you have made in writing this article writing about the art of tin welding on stainless steel. Thank you so much. I can see why you would want to make sure that all of the proper filler metals are used when welding stainless steel. My wife and I have been planning on reinforcing our roof to make it support heavier storms. I think that we should find some professionals that could help to install stainless steel to assure that our roof is strong enough to withstand most dangerous storms. Sir, you are doing a very good job, but how can I learn this profession from you. It is one I cherished most tanx.